Royal Jubilee, Victoria General and Gorge Road hospitals. Caring for the whole patient — the Island’s largest hospital provides comprehensive healthcare to all Vancouver Island residents. With over 4,300 staff and physicians and sprawling across 37-acres in the heart of Victoria, Royal Jubilee Hospital is Vancouver Island’s oldest and largest healthcare centre. It serves more than 90,000 patients each year, providing comprehensive hospital and emergency care along with teaching services to medical students. Royal Jubilee Hospital is also the Island’s referral centre for burn, cancer, cardiac, mental health, renal, respiratory, and vascular treatment. The Diagnostic and Treatment Centre – A 500,000 square-foot facility that includes 14 operating rooms, the emergency department, imaging and obstetrics, morgue, laboratory, post-anesthetic recovery, psychiatric intake rooms, central processing and sterilization unit, and pharmacy. The Patient Care Centre (PCC) – Opened in 2011, this 500-bed, eight-story healing centre is among the world’s first to incorporate elderly-focused design features like ceiling lifts to reduce falls and injuries, contrast colouring to prevent confusion, handrails and rest areas to support mobility, and high tech monitoring systems that balance safety and privacy. The All Nations Healing Room – A culturally safe and healing environment designed with input from First Nations’ elders. Mental Health Services – The Archie Courtnall Centre provides Psychiatric Emergency Services for patients with mental health and addiction challenges. Those requiring a longer stay are transferred to an inpatient unit in the first two floors of the Patient Care Centre, where there’s also a dedicated Seniors Mental Health Unit. To support patients and families living in our community, mental health services are also available on an outpatient basis through the hospital’s Eric Martin Pavilion. Burn Unit – Located on the seventh floor of the Patient Care Centre, this is the Island’s centre for treating patients with burns and complex wound-care. Renal Unit – At Royal Jubilee Hospital lies the main dialysis centre for kidney patients on Vancouver Island. Help us continue to make miracles happen – like Ted’s. Yes, I want to support Royal Jubilee Hospital. 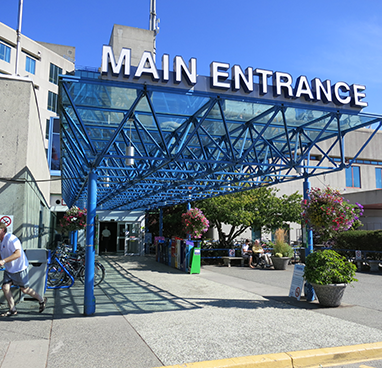 With over 2,300 staff and physicians, Victoria General Hospital, located in the Victoria suburb of View Royal, provides comprehensive and emergency care. It is also Vancouver Island’s centre for maternity, pediatric, trauma, and neuroscience treatment. More than 100,000 patients pass through its doors yearly, making it Vancouver Island’s busiest healthcare centre. If you have a serious accident, there’s a good chance you will be treated at Victoria General Hospital. Major trauma patients from across Vancouver Island are transferred here by helicopter or ambulance. The emergency department has state-of-the-art isolation rooms and a decontamination area specifically designed for managing pandemics and severe outbreaks. Our neuroscience experts treat a range of conditions, including trauma, epilepsy, tumours, multiple sclerosis, and Parkinson’s disease. Victoria General Hospital operates a regional Stroke Program, and the Stroke Rapid Assessment Unit, two specialized teams that provide world-class stroke care in minimal time, often entirely circumnavigating effects of these potentially devastating events. In addition to being the regional delivery centre for newborns, Victoria General Hospital is also the pediatric specialty hospital for Vancouver Island. 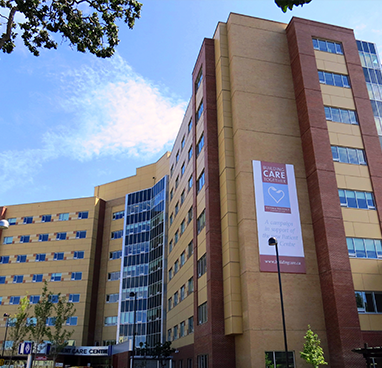 Dedicated pediatric trauma and neonatal intensive care units provide expert care for critically ill and injured children, and the emergency room is specially equipped with the latest in pediatric technology. Thanks to world-class physicians and high-end equipment, less than 1% of pediatric patients have to be transferred to the mainland. Help us continue to make miracles happen – like Jill’s. Yes, I want to support Victoria General Hospital. 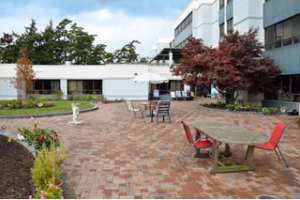 Situated along Victoria’s idyllic Gorge Waterway, Gorge Road Hospital is a 111-bed subsidized residential care and rehabilitation facility providing 24-hour complex care for chronic medical and cognitive conditions, as well as respite care for adults in need of a supportive, peaceful, and secure environment. A recreation therapy coordinator and rehabilitation assistants organize daily activities, monthly birthday parties, bus outings, music entertainment, and seasonal events. Yes, I want to support Gorge Road Hospital.